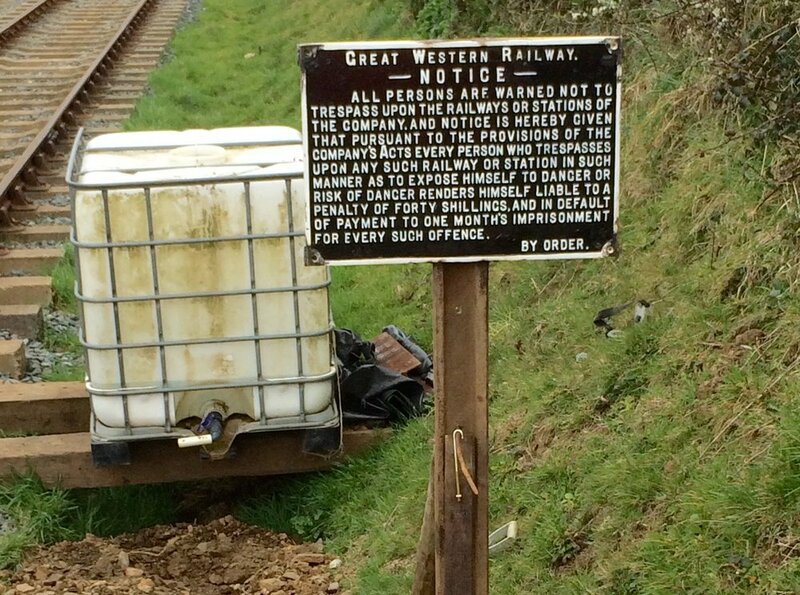 Truthall Halt was the first stop on the line from Helston. It was a short platform with an iconic "Pagoda" style shelter. The reconstruction project has started in late 2016 and completed in the spring of 2018. Official opening of Truthall Halt by Prince Richard, Duke of Gloucester accompanied by The Lord Lieutenant of Cornwall, Edward Bolitho OBE. New buffer stops and an extra 15 foot of line. Arrow head fence going in. January - 2018 - A soggy start! But the arrow-head fence is nearly complete in the workshop. December - pagoda in place and getting ready for Christmas. Work on the platform itself started in November 2016 and so we have made tremendous progress in the year. November - is all about getting ready for the pagoda - laying the base and completing the construction. October - off to a flying start with the base of the pagoda being poured and the black-top going down. By the end of October we have finished the stairs, pagoda base is down, retailing wall nearly finished and the black to down. And the pagoda is ready to move to Truthall. 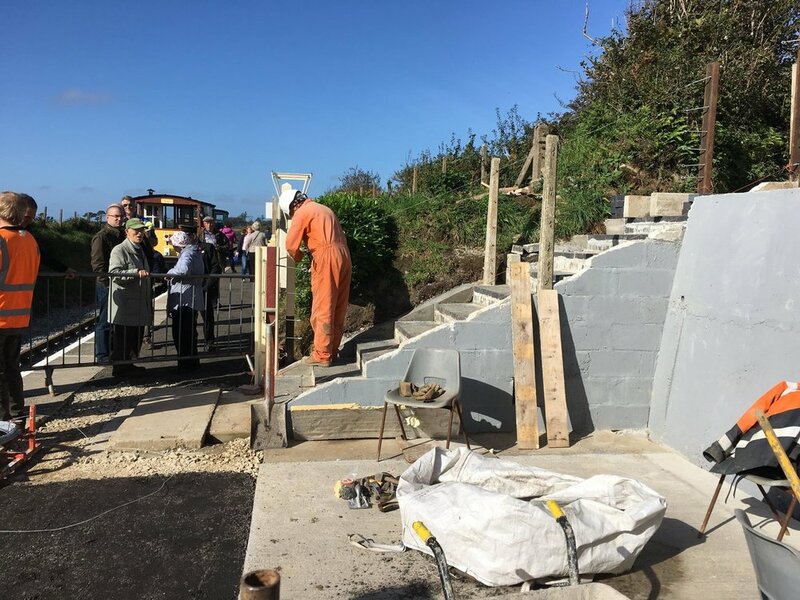 September - good progress on the steps and retaining wall next to the bridge. Shuttering starting to go in for the base of the pergola. August - retaining wall and platform edge nearing completion - and with a special "thank you" to Alan Mitchell Ltd who have looked after us really well. And we are making a start on the steps. 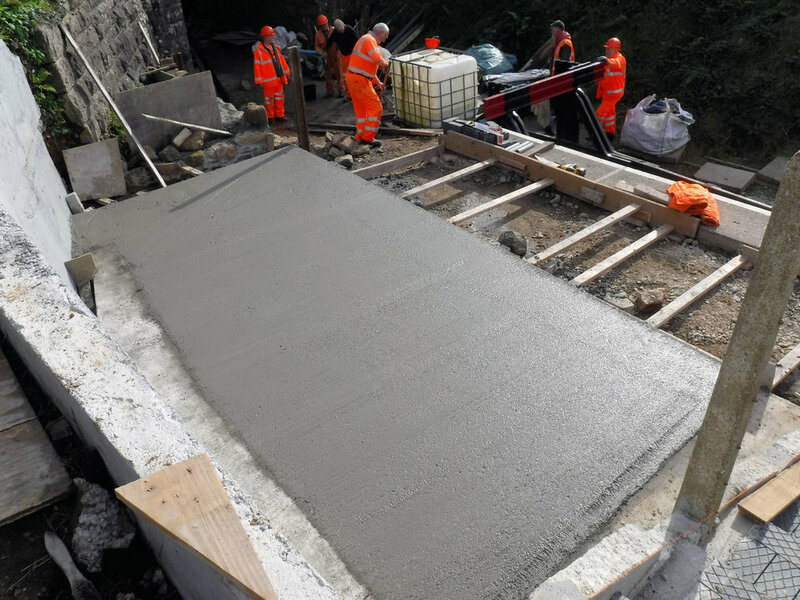 July 2017 - Shuttering and concrete pours (2) for the retaining wall behind the Pergola..
May 2017 - Buffer Stops - rescued from a cement works and now installed at Truthall in time for the May Bank Holiday. And the other end of the platform is looking good as well. 21 April 2017 - This week’s update on Truthall from Paul Bennett. 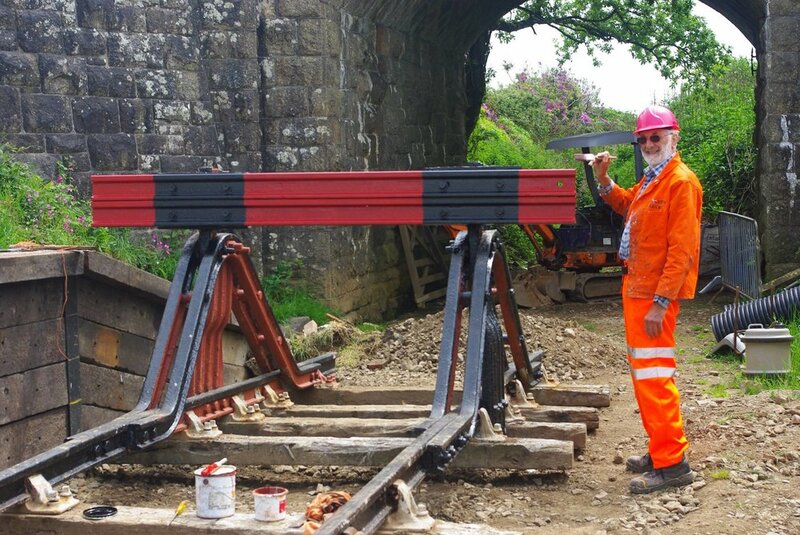 The front of the platform is now complete. We just need to complete the infill and the drainage, then we can start on the steps. New posts for the sign arrived today so we will hopefully get them installed next week and finish installing the fence posts. 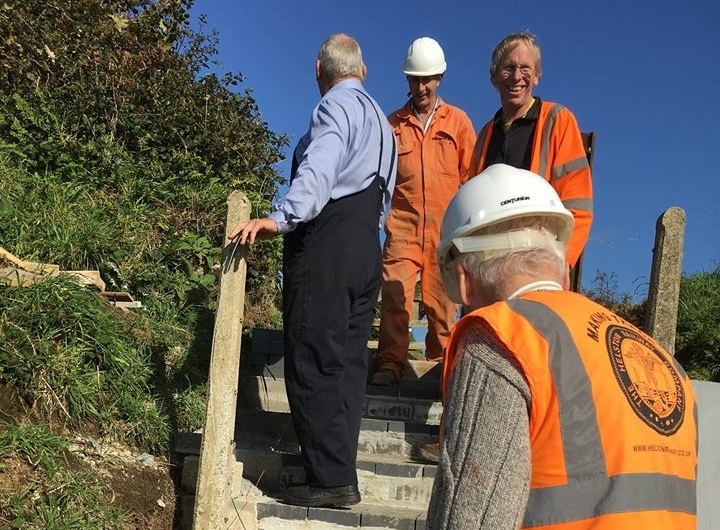 A very generous grant has been received from the Helston Downsland Trust - but funding is still required to complete the project. 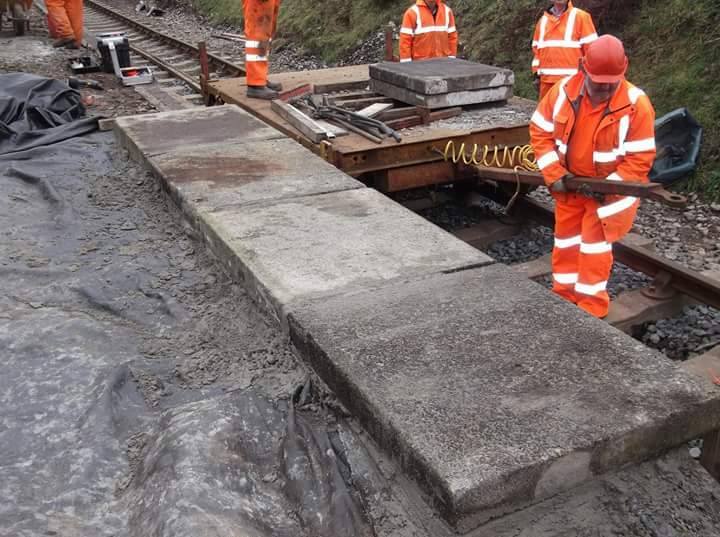 Platform back-filling, surface preparation and flagstone laying. We also need to purchase materials for the signage and furnishings. 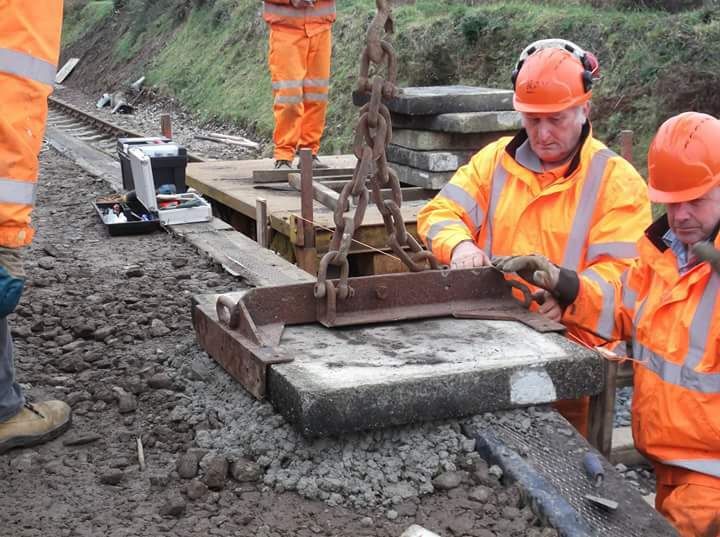 The extension of the track also needs some additional funding to purchase fastenings. 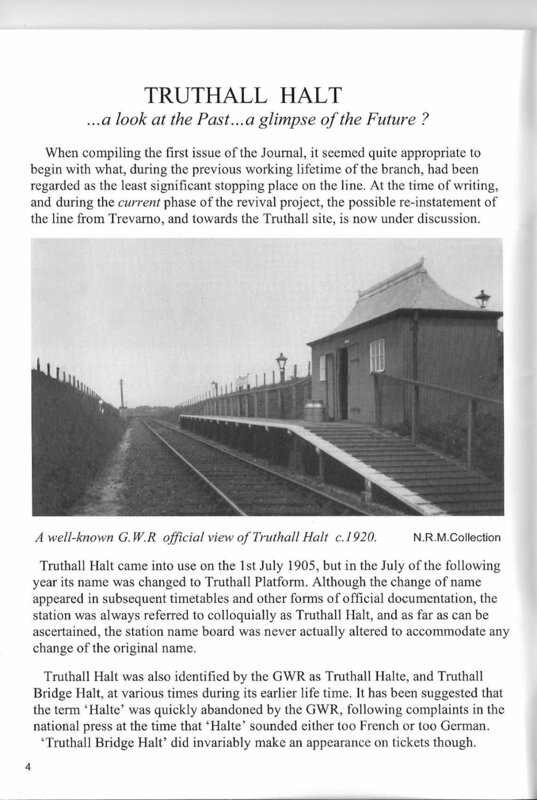 Article about Truthall Halt and our early ambition to reinstate the station. Mid March and the platform is sufficiently complete to be a "destination" for the first visitor on 16 March. This is significant as the line can now be categorised as "transport" and is subject to zero rate VAT. 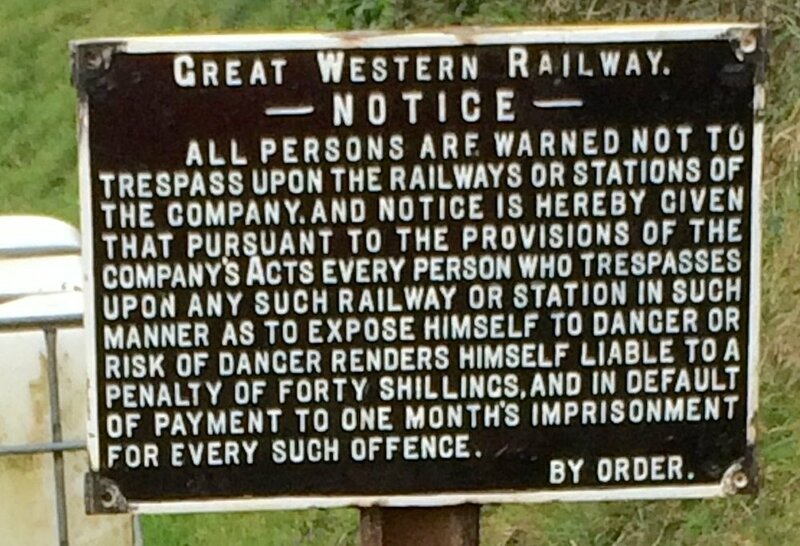 Truthall Halt - 9 March 2017. 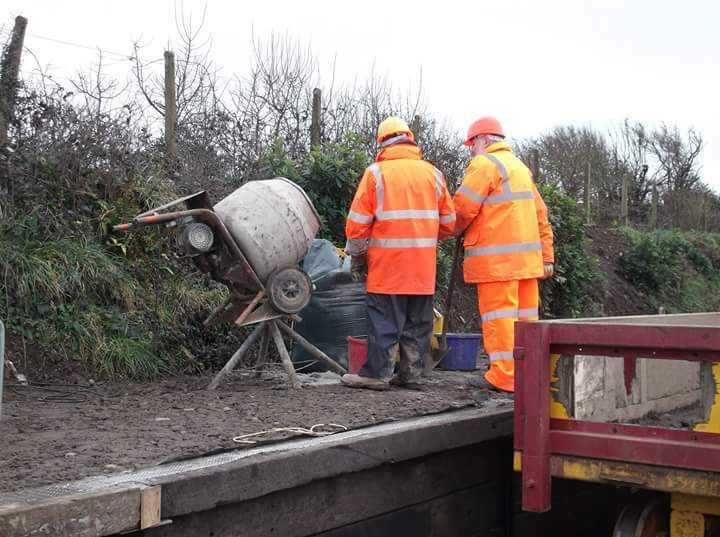 Mid February - clear, dry weather has meant we have made good progress with back-filling the platform and starting on laying the top slabs. 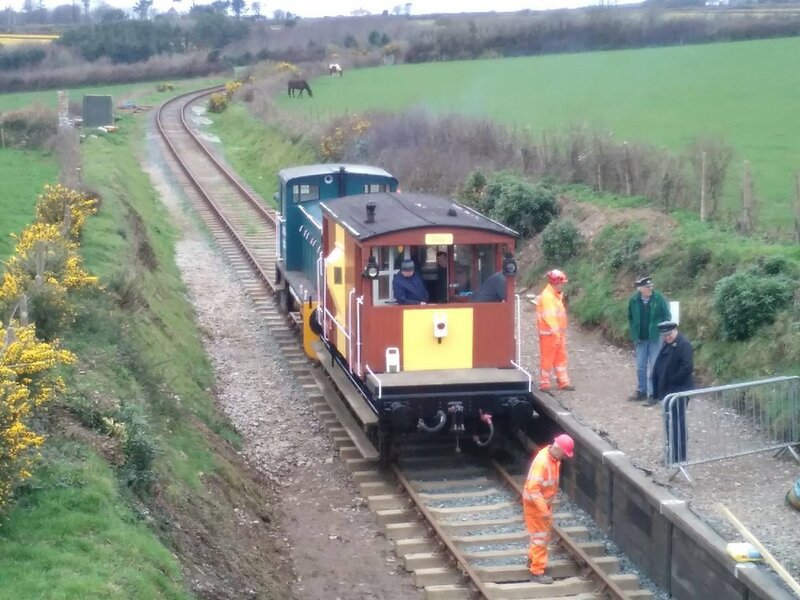 The platform face at Truthall was completed on the 24th January 2017. Next step is to back-fill and to level the platform itself. 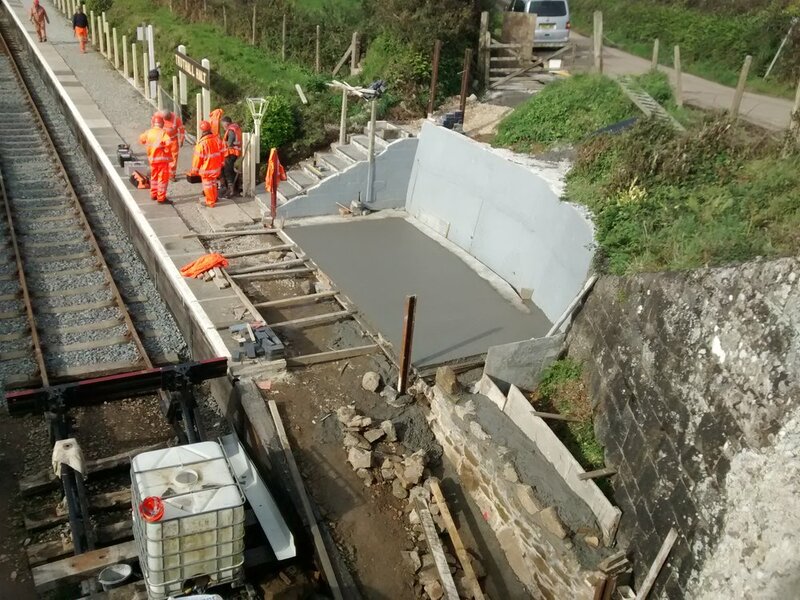 Once complete we will be laying the slabs for the platform edge and then completing the surface. Mind the gap - Tuesday 10th January 2017. End of the line at the end of 2016 - Thank you Ray! 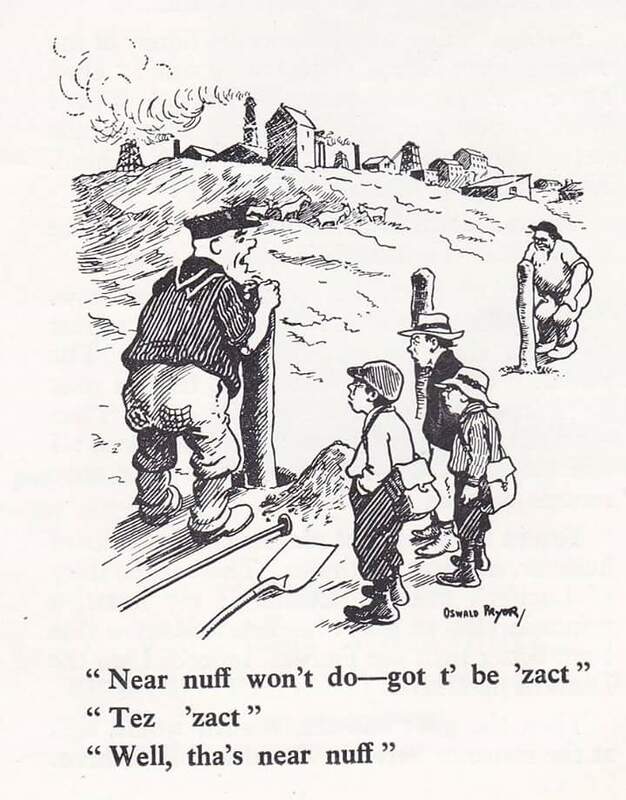 And this is how we did it - neer nuff Ray?. New pagoda frame and cladding complete in the workshops. 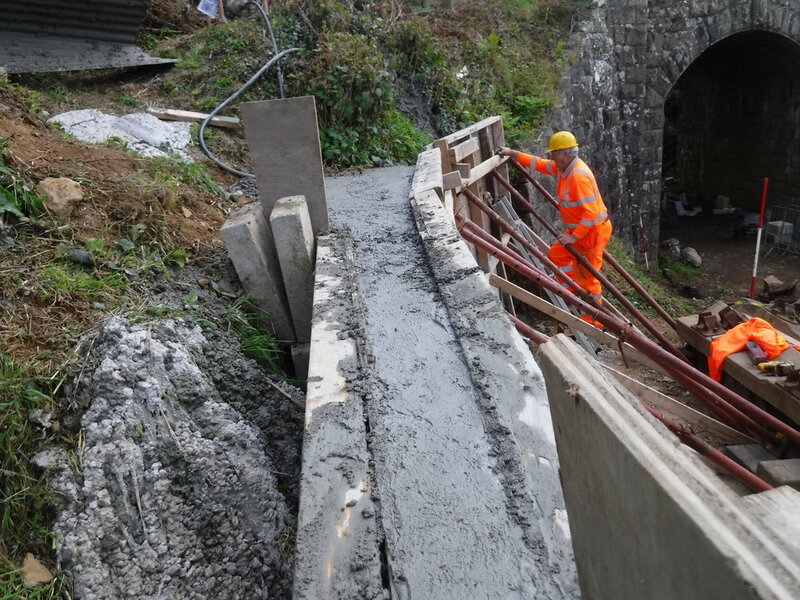 On 26th May 2016 work started on clearing the site beyond the bridge at Truthall in preparation for the construction of drains to prevent flooding caused by the cutting being filled in. 2nd June 2016 - Excavations for a drainage ditch to prevent flooding under the bridge. Trevor in the cab - Wayne in control. 2 June - clearing work under way - the cutting beyond the bridge has been filled in - contents are probably a Cornish hedge.